After Stewart came home from work, we decided to go for a walk. I was sick of being inside and needed some nature therapy. 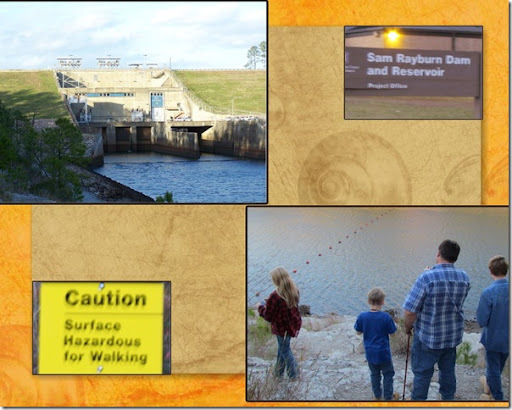 Not having much time to go very far, we ended up going to the Sam Rayburn Dam, which was formerly McGee Bend Dam. My maiden name is McGee, so, of course, I thought that was neat to find out. Now the first thing I noticed when we arrived was the lovely little sign that tells me the surface was hazardous for walking. Did that warning stop us? No! Warning signs are for sissies. 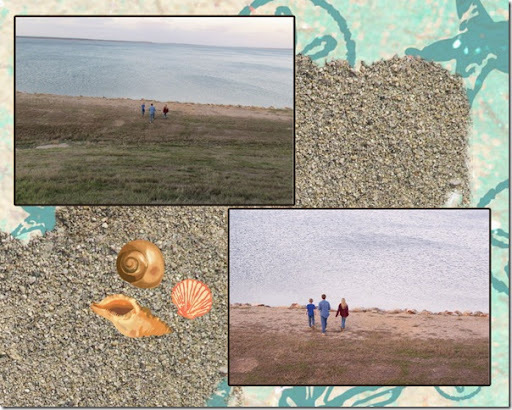 Of course, looking out over the water was not good enough for my bunch, they wanted to be next to the water. There were even signs that warned the water may rise suddenly, but onward we voyaged. My kids eagerly awaited a sudden rise in water, constantly asking me, “when will the water rise, and if it rises where will we go?” My answer was simply, “Up!” It took us some fancy footwork to get down to the water level. Austin, being a wonderful son as always, was right there to help steady mom on the descent. So clinging to each other and a handy tree or two we managed to get down the cliff without any causalities. A stage was imagined from the smooth ledge they scaled and Adam did a little dance resembling “The Twist” then Anna did her supermodel strut across it. 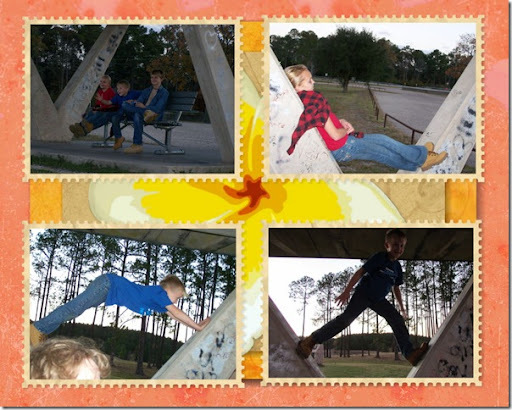 Up, around, over, and through the kids climbed all over GOD’s natural playground. Once again asking if the dam will open so the water will rise. Adam goes into a dramatic “slow motion” run pretending to escape an impending flood. 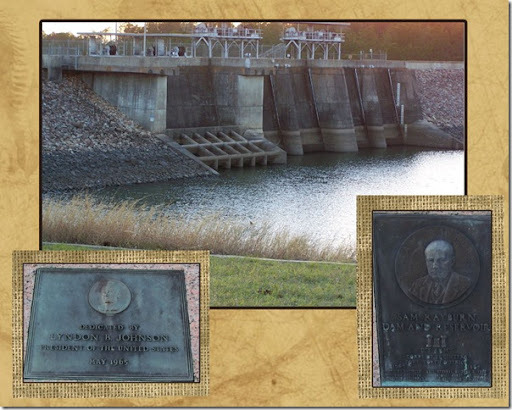 I tell them again, I do not think the dam will open up. We find so much peace and joy when we hike, truly some of our happiest moments. 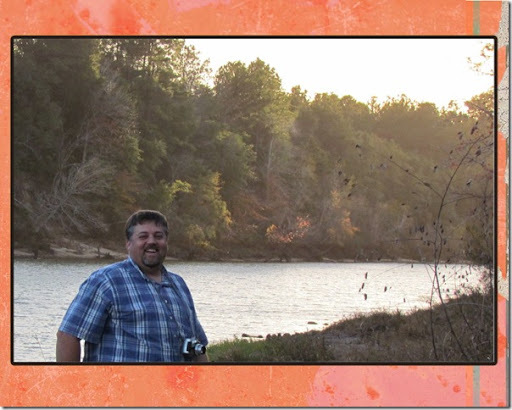 I have to say that the scenery was so beautiful on the far side of the water. The orange and yellow leaves of fall hanging on to their color made a lovely setting for the picture. 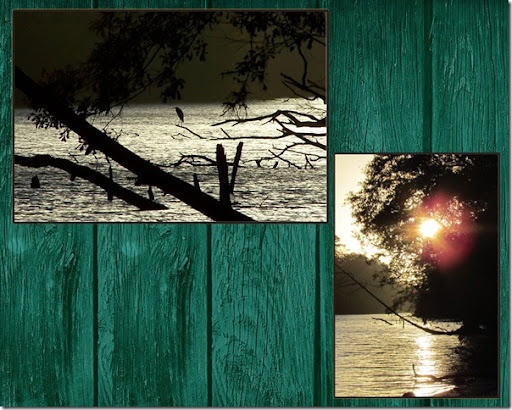 A lone bird sat atop a fallen tree as the sun was getting low it looked very surreal and majestic. 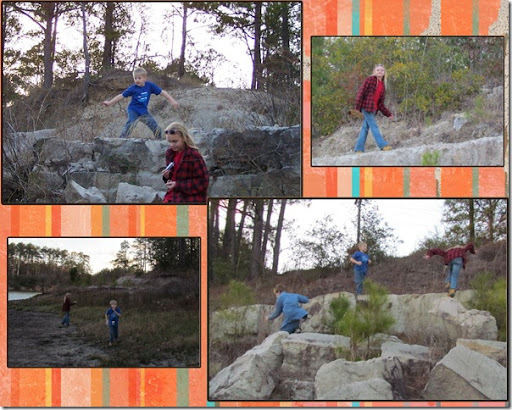 We carefully ascended the rocky banks and left that side of the dam to drive over to the other side where the small park area was. 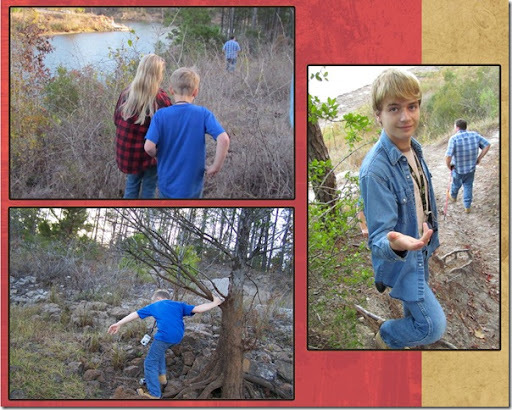 We walked through the pines that were standing on the point by the lake side of the dam. It was quite windy. Anna and Adam found a bird nest that must have been blown out of a pine tree. 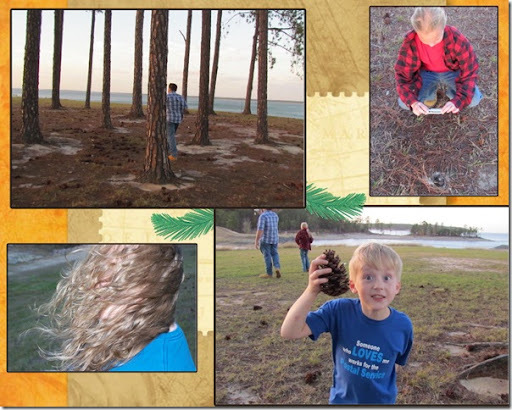 Adam loved the big pine cones that littered the ground. 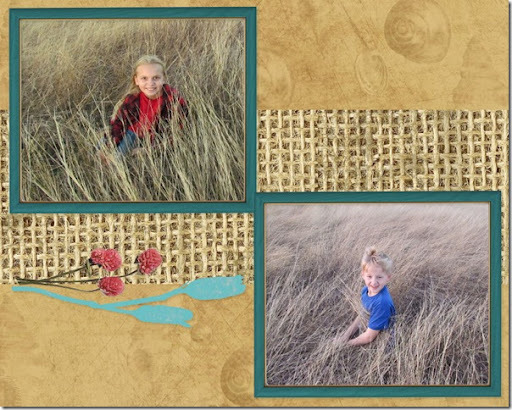 Anna said,”This is like “Little House on the Prairie grass!” Apparently the tall grass reminded her of the Little House on the Prairie books, she loves that time period. 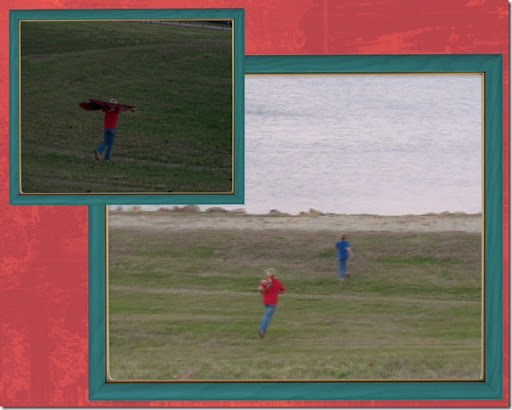 Adam liked to roll around in the grasses too, the wind whipped through his frazzled hair. Stewart and I stayed on the hilltop while the kids walked down to the lake shore. The hill was more than I felt like tackling after the rocks we climbed on the other side. The hill was perfect for rolling down. I told Adam he might not want to try it in somersault form. I told them to lay on their sides and roll down it. I remember as a child rolling down the side of an old sawdust pile that was left from a saw mill that was behind our house. Rolling down this hill was not nearly as dirty. I found it funny that my kids had never rolled down a hill before but they seemed to really enjoy it because the did it over and over. They would get going to fast and have to stop themselves. As carefree and active as my children are, I know GOD must have HIS hand on them protecting them and keeping them safe. Thank you, LORD, for being our protector. 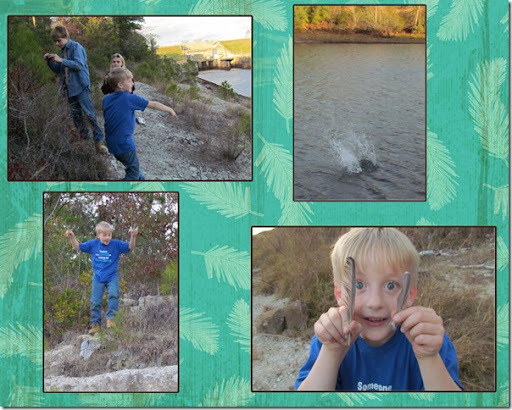 Posted on December 20, 2010, in Hiking, Homeschool and tagged Science. Bookmark the permalink. Leave a comment.